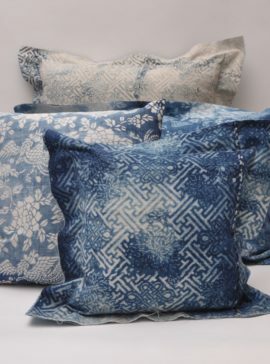 Home collection and accessories for bedding hand dyed from natural indigo plants using ancient artisanal resist paste printing methods. 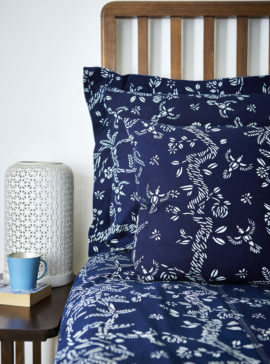 100% cotton with traditional and contemporary blue and white patterns. Sustainable and ethical interior design and accessories. 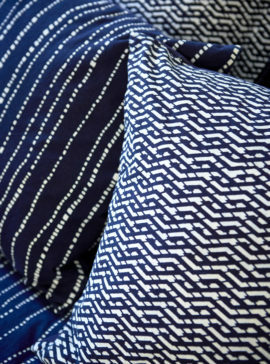 Cushions, bed covers, table linen, curtains and fabric by the metre locally made in London. Fabric is traditionally made in China, the same way it always has been, by a master using 800 year old techniques from locally sourced materials and family business employing the local community. We work exclusively and closely with these artisans to create and develop contemporary home accessories that are for the contemporary home. 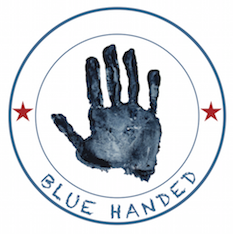 Bluehanded offers 50 patterns to choose from in either the original deep indigo dye or a newly and exclusively developed lighter indigo colour. The indigo dye vats are in over 20 years of continuous operation that produces the highest quality indigo.